Waldwirtschaft Bienenheim is located on the outskirts of Munich in the Aubinger Lohe forest, a popular destination for nature lovers. Bienenheim means “bee home” and the restaurant serves as a meeting place for the bee masters of the nearby bee keeping farm where ecological honey is produced and sold. Unfortunately over time the beer garden has developed in a negative direction and has become somewhat neglected. The larger outside area is now served by the restaurant and the self-service area has shrunk to six fixed-to-the-ground beer garden tables and two round tables. The food stall is still present, but not opened even when there is beautiful weather. To carry food from the restaurant over to the self-service area is not permitted. At least there is still the opportunity to buy oneself a drink. The beer sold is Maisacher Helles (lager) which costs €6.20 p/Maß (May 2016) and Räuber Kneißl Dunkel at €6.40 p/Maß (May 2016). 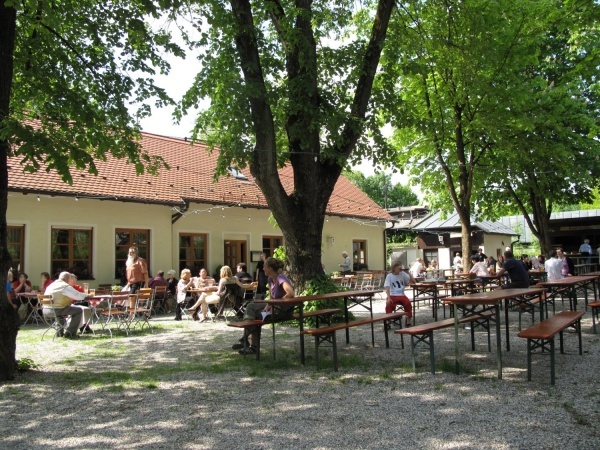 Waldwirtschaft Bienenheim is accessible via S-Bahn to Lochhausen plus a 15-minute walk. The beer garden and self-serviced area is open during the summer months from Tuesday until Friday from 4.30pm and on Saturday and Sunday from 11.30am until it gets cold. The tables in the serviced area are open from Tuesday until Sunday from 11.30am. This page was last modified on 18 May 2018, at 19:11.